There’s so much going on right now that I hesitate to even attempt an explanation. 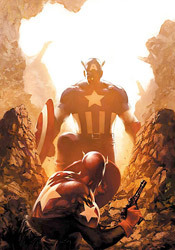 In short: Steve’s still dead, a despondent, imprisoned Sharon Carter is pregnant with his child, Bucky has claimed the red, white and blue wardrobe as his own, Soviets are sabotaging the American economy, the Red Skull has saved his pennies and bought his own politician, and there’s a brainwashed imposter Cap running around in search of his old shield. Got all that? Yeah, thanks for being honest, because I’m not entirely sure I do either and that’s just the tip of the iceberg. Yet despite the complexity of what’s going on behind the scenes, actually reading this issue wasn’t the chore I expected it would be. Ed Brubaker is taking a different approach to this series: rather than keeping the readers in the dark, he’s filling them in on every detail of the enemy’s plan before it unfolds, then allowing the characters’ reactions to those plans provide the drama. If you’ve been keeping up with the series recently, you aren’t surprised by the appearance of another Captain America who looks and sounds a lot like Steve Rogers, but Bucky and the Falcon certainly are. It’s their response to these developments, not the developments themselves, that bring the suspense and keep the readers guessing. Brubaker keeps the story set firmly in the present, discussing a lot of the hot button political issues that are all over the American media. He offers a smart take without coming off as preachy or giving the impression of working on an agenda. Bru keeps a lot of pots simmering on the range top, but they’re all given an appropriate amount of attention. While he’s covering a large set of congruent narratives, he keeps things legible and doesn’t give the impression that he’s handling more storytelling than he can handle at any one time. Which, I’ll be honest, was my biggest concern after the digest-sized recap that opened the issue. Rob De La Torre’s artwork is wonderful throughout the issue. He brings a gritty, cinematic look to the page that’s beautifully framed but still explosive. Where Torre’s style of precise posturing and painstakingly composed panels often carries with it the risk of feeling overly sterile and lacking fluidity, this artist’s efforts are an exception. While his characters hang in the air realistically, mimicking Jackie Chan’s just-this-side-of-lifelike acrobatics, they’re also given enough artistic license and natural body language that they don’t seem too perfect. While I fear that a lot of the intricacies of his artwork are lost behind the bright coloring job they’re given here, that he’d benefit from a more subdued, atmospheric palette, the work is good enough to shine despite that minor handicap. De La Torre gives each character their own face, treats the backdrops sensibly, and really brings the goods when asked to make an impression. This is a guy who was born to deliver stunning splash pages, but also knows how to make an impact within the tighter confines of a page filled with panels. His take might feel too realistic to some, but in my eyes he’s just right, giving the book an instant visual identity and setting the tone so the narration doesn’t have to. This is a fine issue, although I’d think twice about jumping onboard in the middle of the storyline. The opening blurb at the beginning of the issue covers most of the fine details, but there are quite a few points it takes for granted that wind up being pretty important as the story plays out. If you’ve been a loyal reader for some time now, this issue is just a continuation of what’s becoming an epic saga. If you’re fresh to the scene, give it a borrow and see if you can find your bearings first. It’s very rewarding if it doesn’t lose you somewhere along the way.